If you create a lot of Facebook Ads, I highly recommend using Facebook Power Editor because of its ability to “improve advertisers’ efficiency in creating, editing and managing a large number of campaigns and ads.” While Power Editor makes creating, editing and managing lots of Facebook Ad campaigns easier, we’re going to show you a shortcut to create saved target groups in Facebook Power Editor. Why create saved target groups in Facebook Power Editor? One of the challenges with creating Facebook Ads is duplicating your audience. If you have a lot of interests and Facebook partner categories created, this can take up a lot of your time. For instance, just imagine having to complete the following fields for every single Facebook Ad that you create. Now imaging filling in that same information over and over for various Facebook Ads. It can be very time-consuming. Fortunately, there’s an easy way to create saved target groups in Facebook Power Editor. By creating a saved target group in Facebook Power Editor, you won’t have to input any of this information over and over. Instead, you can just select your target group. Facebook advertising can really boost the number of fans on your Facebook Page. Unfortunately, if you are don’t target the right audience with your ads, while you may bring in new fans, they may not interested in buying your products. With the help of a new feature called Facebook partner categories, you can improve your Facebook ad targeting and to reach more of the right customers. According to Facebook, here’s their definition of Facebook partner categories. Choose your audience based on information that data providers have about things people do off of Facebook. For example, partner categories let you show your ads to people who have a history of purchasing pet food. In simple terms, Facebook partner categories uses data from Acxiom, Datalogix and Epsilon (companies who collect and analyze data) to help you improve the targeting of Facebook Ads. By using Facebook partner categories, now, you can create ads that target specific interests, such as the pages someone likes. You can then incorporate additional data about the user you want to show your ads to such as their occupation, food they are interested in, and their income levels. To use Facebook partner categories, you first need to be using Power Editor. This video walks you through using Power Editor with Facebook Partner Categories. Where does Facebook Partner Categories get their data? Facebook partner categories sources their data from Acxiom, Datalogix and Epsilon. If you have ever filled out a census or taken a survey at the mall, chances are, this data is shared with these companies and it is now used in Facebook partner categories. Here’s a breakdown on the data each company provides to Facebook partner categories. Right now, Facebook partner categories are only available in the United States. Acxiom data focuses on homeowners, renters and average income. Datalogix focuses on purchase data such as vehicle data; make, model, how old your vehicle is, along with consumer packaged goods like if you consume carbonated beverages, coffee, eggs, cereal, etc. Epsilon focuses on data related to your occupation; such as being a Lawyer or teacher. Note: while they know a lot about your general purchasing habits, the data that is shared isn’t personal data, such as your name or address. To help you understand how to use Facebook partner categories here’s an example. Say your business sells carbonated beverages and you want to reach people who drink them. Your ideal customers who buy your product are teachers. Previously, if you wanted to target your customers, you could only target their interests – the Facebook Pages they liked, such as carbonated beverage drink makers (a broad market) along with their age and their gender. What you didn’t know was if these people bought carbonated beverages or if they just liked the business for other reasons. Using Facebook partner categories, you can now get better at this. Not only does this improve the quality of your ads, but by using Facebook partner categories, you can get your Facebook ads in front of the right people – those who are interested in the type of product you have. 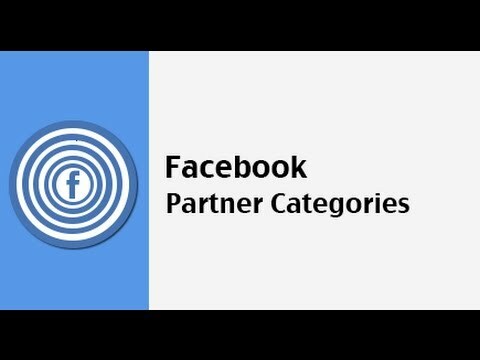 How do you plan to use Facebook Partner Categories? Facebook partner categories is an extremely powerful advertising tool. I would love to hear how you plan to use it to improve your business. Let me know in the comments. While Facebook is great at helping us connect with friends and family and businesses, as the volume of comments grows, it can make it difficult to follow the conversation. Fortunately, they have rolled out a new feature called Facebook reply links. Previously, anytime you commented on a Facebook status update, your comment would get posted at the bottom of the comments thread. This made it difficult to follow the conversation because you had to read through multiple conversations. With the introduction of Facebook reply links, it’s now a whole lot easier to reply to comments because you can reply to any comment and it will keep comments threaded (and organized). Here’s an example of the old form of Facebook comments and Facebook reply links in comments. So how do you get the new Facebook reply links within your comments? Facebook close friends, it’s a feature that has been around since mid 2011, yet it’s a feature that a lot of people don’t talk too much about. For those of you who want an easier way to view updates from a select group of friends, with the added bonus that you get notified when they post a new update, then Facebook close friends is for you. Personally, I find “close friends” to be extremely valuable because it allows me the opportunity to easily view updates from my favorite people on both the desktop and mobile versions of Facebook – and get notified when they’ve posted new updates. So after you’ve built up your list of close friends on Facebook, how do you remove them? If you want to remove Facebook close friends from your list, there are four ways that you can go about doing this. Yes, you read that correctly, there are four ways that you can remove Facebook close friends. To help you out, I’ve created a short two-minute video that gives you an in-depth view of the four areas where you can remove Facebook close friends. The video also shows you how to remove Facebook close friends. If your business seems to be struggling with getting more exposure on your Facebook Page, it might be time to learn how to create Facebook check-in deals. For those of you who are unfamiliar with check-in deals, here’s a summary of check-in deals. A Facebook check-in deal is a way to incentivize customers to check-in to your business on Facebook from their mobile devices like a tablet or a smartphone. Anyone with a business (brick and mortar or online) can create a check-in deal to reward customers. Individual deal – Offer a discount to an individual for checking in to your business. Charity deal – Your business makes a donation to a charity when someone checks in. But wait, I heard Facebook check-in deals were being replaced. While InsideFacebook.com published an article back on February 29, 2012, declaring that Check-in Deals were no longer being used, I’ve checked with my sources at Facebook and check-in deals are sticking around! Do you need to backdate Facebook posts on your Facebook Page to fill in your companies history? Are you going to be at a conference and need to schedule Facebook Page posts ahead of time? This article will show you how to schedule and backdate Facebook posts on your Facebook Page. One of the most overlooked features on a Facebook Page is the ability to backdate Facebook posts. Backdating Facebook posts can help fans share in your companies rich history. Here’s how to do it! With the backdating posts feature, this allows companies with a deep history to be able to share it on their Facebook Page. For example, do you know the history of McDonald’s and how they got started? You can also check out Time Magazine on Facebook. They have done a great job filling in the history of their magazine by adding in past covers and articles from old magazines. One thing I like about Facebook Pages that backdate their Facebook posts is that it gets them to focus on their true content. Too many times do I see pages posting quotes and photos that are unrelated to their business. In most cases, their current content is getting little engagement with fans, so they’re moving away from focusing on their business and filling up their page with content that won’t add much value in the long run. Besides backdating Facebook Page content, you can also schedule content to go out. For example, you can’t be speaking at a week-long conference and expect to keep your Facebook fans updated. In this situation, you may want to schedule a few Facebook posts ahead of time when you know you will be out. This way there is some engagement happening on your Facebook Page. To schedule and backdate posts on Facebook, follow these instructions. Do you have content you want to share with people you are not friends with on Facebook? Instead of adding people you don’t know, you can add the Facebook follow button. Why add the Facebook follow button? The Facebook follow button is a great tool to use when you want to let people you don’t know see your updates without being Facebook friends. This protects your Facebook Profile so that people who follow you cannot see your email address, date of birth, etc. When you follow someone on Facebook, this also adds their status updates to your news feed. You should only add someone as a friend when you know them personally. If you don’t know someone personally but want to hear what they have to say, following them is a good option. When you follow someone, you’ll only be able to see their public updates. For people you are already friends with, you will see a Friends button. Use this button to unfollow their posts without unfriending them. To turn on the Facebook follow button on your Facebook Profile, follow the instructions below. Do you want to delete a Facebook Page permanently? We’re going to show you how to permanently delete a Facebook Page you no longer want or need in just four steps. To delete a Facebook Page, simply follow the instructions below. Remember, when you delete a Facebook Page, not only are you permanently deleting it from Facebook, but you’re also going to lose any photos or status updates that you’ve posted (which probably isn’t a big deal if you’re planning to delete a Facebook Page). Today, Facebook rolled out Facebook Graph Search. For those of you who don’t know about Facebook Graph Search, it a very powerful graphing tool that let’s you search anything you want on Facebook. One important thing about Facebook Graph Search – it stores your search history. If you don’t like Facebook storing your graph search history, you can delete it. Here’s how to delete Facebook Graph Search History in just three easy steps. Do you need to get your Facebook Profile URL? If you’re new to Facebook, getting your URL can be a challenge because there are lots of places you can look. Fortunately, you can get your profile URL in just 3 quick steps. To get your Facebook Profile URL, follow the instructions below.